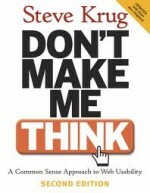 I hesitated many years before picking up Don’t Make Me Think, by Steve Krug. I always considered that it was basically about designing web sites that all look the same, and follow banal guidelines on ergonomics and presentation. After hearing so many people and writers refering to this ebook I couldn’t hesitate any longer. Besides, I think we can all agree it’s better for people who visit our carefully tuned web sites to not think, just click and buy. Right? So I got the ebook. And I can pretty much say that I was right about my assumptions. Nevertheless, Steve Krug is no idiot, and he knows that branding, and emotion, and other human factors make the web an exciting place to create. He is definitely not saying that the web needs to be dull and useless. On the contrary. There just need to be some rules, or conventions as Steve says, that help the user quickly understand what the site is about, and where to go from there. Complete and wonderful logic. But I couldn’t quite help thinking that there must be something more to the web. When I got started on the web, I even thought that making people think was a benefit. It’s not like we are watching TV passively. When we get on a web site, there is some need for intellectual stimulation. Isn’t there? Isn’t that what being different is about? Though Steve’s ebook revolves and revolves yet again around conventions, he understands that it’s human nature to want to do better. To learn and improve. To explore. The web is a vast territory with much, indeed perhaps too much to discover. That’s why we love it. We feel like we’re pioneers. We are no longer working in our father’s shop. We’re creating our own shop. And though conventions can be useful for the ordinary moment, we need more. Constantly. Without that desire, the web stops. If you’re not going to use an existing Web convention, you need to be sure that what you’re replacing it with either (a) is so clear and self-explanatory that there’s no learning curve—so it’s as good as a convention, or (b) adds so much value that it’s worth a small learning curve. Now, don’t get me wrong, web sites have to be easy to use, or intuitive as we like to say. But I believe strongly that we can add value by being different. At the same time I have to admit, whether or not I agree with conventions, Steve is absolutely right: we cannot just do something for creativity’s sake. It has to make sense. So much sense, that it may even become a convention. But that doesn’t matter. What matters is that the user appreciates it, understands it, and can move forward according to his or her needs. So I spent the last couple weeks reviewing the sites I’ve built with my team over the years. And though we strive to offer an exciting, and sometimes different user experience, I couldn’t think of any one site that really changed the way the web functions. Yes, we like to offer an aesthetic alternative to the status quo, but that is not what will add to the value of a web site. So what will add value? In other words, what really differentiates one site from the other, and what will help users remember one particular site more than the next? The answer certainly depends on the given target market, and what the site is selling. There is no one right answer. What makes Facebook and Twitter amazingly successful cannot necessarily be repeated for a BtoB site. If we look at the corporate web environment, and focus on their added value for the web, the objective is to get the user to buy into their service or product offering. This is not about e-commerce, but about producing an image that’s clear and related to the target’s expectations. For me, this is where the web gets challenging, and this why you need everyone at the table, because image is about content, design, interactivity, structure, performance. UX if you will. A great memorable experience occurs because everything led the user to an identifiable goal very easily. To go with Steve Krug, the user didn’t think, he or she was immersed in the experience at all angles and everything happens according to a pre-determined plan. Destiny I suppose. That means that we can maintain the conventions Steve discusses because they help the user quickly understand what everything is about, where he or she is on the site, and where to go. So if that is the case, what can really be considered added value? I think that if value comes from a variety of sources, then added value must surely be in the details of the whole experience. Not just in the content, but also the micro-copy. Not just in the beautiful photos, but the way the photos are framed and aligned. Not just in the breadcrumbs, but the way the breadcrumbs are positioned. Not just in the interactivity, but in the usefulness of a specific function. Not just in performance, but in consistent performance. By focusing on all the details we eliminate the superfluous and we are left with the essential. This is altogether another way of saying «keep it simple». Though it is perhaps the most difficult task to achieve, we must stay simple while diving into the details. It is the details that lead us to simplicity and then we can find the added value. I had no intention of reading Don’t Make Me Think, and even now that I am finished reading the ebook, I still find it rather like a beginner’s course to web site creation. Yet, I must thank Steve for reminding me of some of the essentials. And that to be different and create value you must first know the details of what already has proven to work.